Peekskill Meteor: October 9, 1992. This famous fireball was seen and filmed across several eastern states. 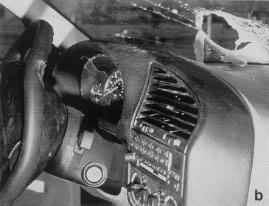 It broke up into many fragments, one of which hit the trunk of Michelle Knapp's 1980 Chevy Malibu. When Ms. Knapp investigated a crash sound outside her Peekskill, NY home, she discovered the damaged trunk and found a warm 12-kg meteorite lying beside the car. Spaulding near-miss. 7:00 p.m., Aug. 31, 1992, Noblesville, Indiana. Brodie Spaulding (13) and Brian Kinzie (9) were talking in Spaulding's yard when they suddenly heard a low-pitched whistle followed by a thud. Spaulding said he first heard the strange sound over his right shoulder, but events happened so fast that he did not actually see anything. He walked 3.5 meters to where a small black stone lay in a crater about 9 centimeters wide and 4 cm deep. The rock, he said, felt slightly warm. Spaulding contacted Purdue University to have the rock analyzed, where its cosmic origin was confirmed. "When I sit down and think about it," said Spaulding, "it was kind of scary." The picture also shows Purdue chemist Michael Lipschutz photographing the boys in the spots they were standing when the meteor hit. The arrow shows the location of the small crater. Mbale meteorite fall, August 14, 1992. A shower of meteorites (ordinary chondrite of type L5/6) broke apart over Mbale, Uganda at 12:40 UTC on this date. The debris field was 3 by 7 km in size. A 13 year old boy was hit in the head by a 3-gram fragment but was not injured, as the meteorite's fall was broken by banana tree leaves. See The Dutch Meteor Society's illustrated description of the recovery effort. Alt. Donahue near-miss. Nov. 8, 1982, in Weathersfield, Connecticutt. Robert and Wanda Donahue settled down for a quiet evening watching television. About halfway through M*A*S*H, they heard a loud crash from the front of the house. They ran into the living room to find a hole in the ceiling and plaster dust and smoke everywhere. Moving outside, they saw a hole in the roof. They called the fire department and ten minutes later, a fireman found a six-pound, five-inch meteorite under the dining room table. The stone had ripped through the roof and living room ceiling, bounced off a carpeted wooden floor (cracking a support beam for the floor in the process), traveled up through the ceiling a second time into the attic, came down through the ceiling in the dining room, knocked over furniture and dented a wall before coming to rest under the table. Six more small fragments of the meteorite were later found in the Donahue's vacuum cleaner, which Mrs. Donahue had used to tidy up the house a bit before all the scientists and media arrived. Hodges meteorite. November 30, 1954, Sylacauga, Alabama. Annie Hodges was napping on her couch when an eight-pound stony meteorite crashed through her roof. It bounced off a large console radio and hit her in the arm and then the leg, leaving her badly bruised. Getafe: On the afternooon of June 21, 1994, Jose Martin and his wife, Vicenta Cors, were driving in Spain from Madrid to Marbella. As they zoomed past the town of Getafe, a three-pound rock smashed through their windshield on the driver's side, ricocheted off the dashboard, and bent the steering wheel, breaking the little finger on Martin's right hand. It then flew between the couple's heads and landed on the back seat. Other than the broken little finger, they were okay. The stone was chemically analyzed (see this site for details) but cannot be confirmed as extraterrestrial on this basis. Eighty-one additional fragments weighing a total of 55 kg were collected from the area. A recent house-whacking; September 23, 2003, New Orleans, Louisiana. Roy Fausset came home to his two-story house to find debris-strewn holes punched through his roof, second-story floor, and first-story floor. Chunks of stony meteorite were recovered from his crawl space. Neighbors reported hearing crash noises a little after 4:00 p.m. that day. Horse fatally struck: May 1, 1860, New Concord, Ohio. Dog fatally struck: June 28, 1911, Nakhla, Egypt. First car struck: September 29, 1938, Benld, Illinois. The meteorite crashed through the roof of the garage, then through the roof, back seat, and wooden floorboards of a car, before bouncing off the muffler and lodging the the seat cushion.